Rejoice unto the Lord; Ah silly Soul; An aged dame; O dear life, when may it be; Cone to me grief forever; Who likes to love; O that most rare breast; All as a sea; Ye sacred muses; Constant Penelope; O God that guides the cheerful sun; Lullaby: My sweet little baby; How vain the toils. There is a certain aura to Elizabethan music when performed by counter-tenors and we are incredibly blest at the moment with several very fine ones. At least three of them have recorded for and/or do record for Hyperion: David Cordier, James Bowman and Robin Blaze. The repertoire on this disc seems ideal for counter-tenors. It comes as something of a surprise to discover that Byrd's consort songs have not been tackled by this voice on a complete CD before. First we should establish what exactly is a consort song. Mostly they are for voice accompanied by a group of viols, normally four: soprano, alto, tenor and bass. The subject matter is various but often it is serious if not rather poe-faced; dare I say Protestant. The 'Elegy' on the death of a famous person, like the ones here for Sir Philip Sydney ('Come to me grief for ever' and 'O that most rare breast') and for Thomas Tallis ('Ye sacred muses') are typical. Sometimes they extol the virtues of a pure life away from earthly desires. 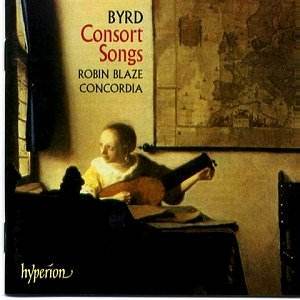 Byrd's fine 'O Lord how vain are all those frail delights' (not recorded here) is an example. Not all of these songs are elegiac and an effort has been made by Concordia to search out some more light-hearted ones, for example 'Who likes to love' and 'Constant Penelope'. Given this background it may seem odd that some of the consort songs are given here as lute-songs. The chosen cover picture should give a hint however, as it is a detail of Vermeer's beautiful but inscrutable painting known as 'Woman with a lute'. All is explained by Elizabeth Kenny (the lutenist) and Mark Levy (a viol player) in their useful accompanying booklet notes. They write "A Spanish scribe working for Paston's household produced a set of lute books that are a major - and in some cases the only - source of Byrd's' later songs. ... The lute tablature contains most of the polyphony in a much more economical form than partbooks. Usually the vocal part is omitted, so we are left with complete accompaniments. In some cases however, the vocal line is present." Later “... It has been suggested that they may have been self-contained instrumental solos." So we have performances with viol consort only ('Come to me grief for ever') and performances with lute only, as for example the tender 'O dear life' with words by Sir Philip Sidney himself. There are also performances for the full consort that is for lute doubling on viols (' Rejoice unto the Lord'); these I particularly like. I suppose ideally one would like a disc of this music with three voices, say soprano, alto and tenor sharing the songs between them. However, not only does this disc offer a variety of performance 'colours' but there is also a variety of musical mood and style, making the whole disc absolutely delightful. Full texts have been provided and most are anonymous, but as well as Sidney, Sir Edward Dyer is represented ('O that most rare breast') and a translation after Ovid (‘Constant Penelope’). I found myself wondering if the other texts might be by Byrd himself, especially the exquisite 'Lullaby' a sombre but beautiful Christmas song which lasts over twelve minutes but which never drags. The recording is first-rate and seems to be ideal with just enough space around the voice to give it presence yet with detail audible especially when the light cool lute sound is heard against the viol consort.